This fossil, dated to approximately 90,000 years ago through the Uranium Series, Luminescence (OSL) and Electron Spin Resonance (ESR) dating techniques, is one of the oldest modern human remains found outside of Africa and the Levant. The Centro Nacional de Investigación Sobre la Evolución Humana (CENIEH) participates in an investigation published today in the journal Nature Ecology and Evolution on the discovery of a fossil Homo sapiensfinger bone at the site of Al Wusta in Saudi Arabia. 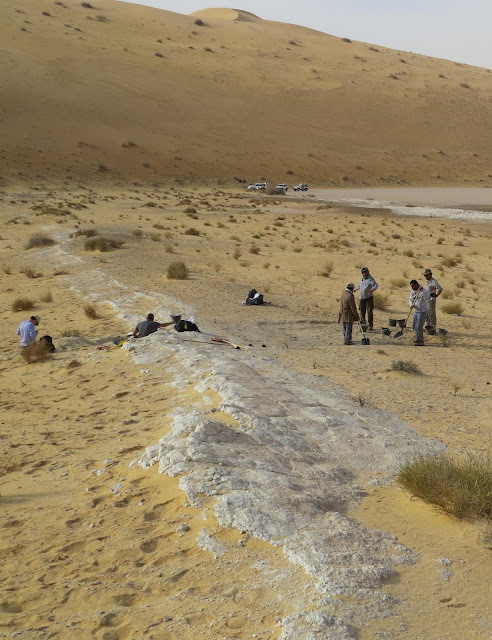 Besides the well preserved and small human phalanx (3.2 cm), archaeological surveys and excavations at Al Wusta, an ancient fresh-water lake located in what is now the Nefud Desert, led to the discovery of numerous animal fossils, including hippopotamus and tiny fresh water snails, associated with abundant lithic tools. “Using a technique called Uranium series dating, this fossil was found to be 90,000 years old, making it the oldest directly dated Homo sapiens fossil found outside of Africa and the Levant”, explains Mathieu Duval, from the Australian Research Centre for Human Evolution at Griffith University, Australia, who performed the ESR dating at the laboratories of the CENIEH. “To confirm this age, we also used other dating methods applied to the material found in association with the human fossil, such as dating the sediment through Optically Stimulated Luminescence (OSL), and dating a hippopotamus tooth through ESR, which I performed at the CENIEH”, says Mathieu Duval. This new discovery confirms that early dispersals of Homo sapiens out of Africa were more spatially and temporally extensive than previously thought, as already claimed by many researchers in the wake of the recent discovery of a modern human maxilla at Mislyia cave, Israel, and other human fossils found at the Chinese site of Fuyan (Daoxian), in which the CENIEH also played an important role. “Such studies enable us to progress in the scientific debate and change the paradigm. The original approach to the Out of Africa theory is now obsolete. Homo sapiens left Africa and the Levant over 80,000 years ago. Now we want to know the routes followed, the reasons for their journey and the destination of the first explorers of our species”, explains María Martinón, director of the CENIEH. The work, led by Huw Groucutt from the University of Oxford and Michael Petraglia from the Max Planck Institute in Jena, involved an international team from Saudi Arabia ( the Saudi Commission for Tourism and National Heritage, SCTH and the Saudi Geological Survey), the United Kingdom, Germany, Spain and Australia and received financing from the European Union and Australia: Marie Curie International Outgoing Fellowship PIOF-GA-2013-626474 and the Australian Research Council Future Fellowship FT150100215, both granted to Mathieu Duval.